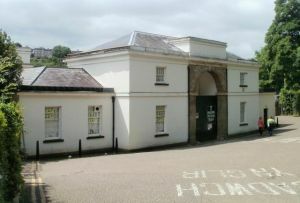 The Torfaen Museum is housed in a Georgian stable building, and traces the history of the Torfaen, including industrial heritage, Japanware, social history, and Pontypool RFC. The museum holds over 15,000 items tracing the rich heritage of the Torfaen region, from art, historic artefacts, and social history. The collection covers prehistory, medieval finds, and a large collection covering the industrial revolution. Themes include local Japanware, Pontypool Rugby Football Club, and the history of Torfaen. The name Pontypool was almost synonymous with Japanning in the 18th century. The industry launched the careers of many successful artists, and the exhibit displays Japanned items drawn from its own collections and from the National collection. The Japanning process was developed by Edward Allgood (1681-1763), who set up a business in 1732 to emulate the popular lacquer and varnish on furniture imported from the Orient. Allgood's Pontypool Japanware used powdered oxides made from iron ore to colour metal, wood, or papier mache. The process gave a brilliant sheen to ironware products, and had the advantage that it could withstand heat better than imported Chinese products. As a result of Allgood's successful experiments, Pontypool became the centre of Japanware production, and the industry helped shape the history of the Torfaen region. Another museum theme is the British Nylon Spinners company, which has been one of the area's largest employers for decades. Displays cover the history of the BNS through old photographs, paintings, rare artefacts, and documents from 1948 to the present day. The museum holds the historic collections of the famous rugby club, with memorabilia including photos, match jerseys trophies, and 'Pooler' memorabilia. The club collections date to its origins in 1878. Rugby fanatics will enjoy objects connected with the Pontypool RFC Front Row. The Story of Torfaen collection covers the entire region, from Blaenavon in the north to Llantanam in the south, and displays prehistoric objects, a medieval treasure trove, and objects from the industrial heyday of the region. Linked to the main museum collections is the Oriel Barker art gallery, the largest gallery in the Torfaen region. The gallery holds 18th century paintings by local artists Thomas and Benjamin Barker, among other historic paintings and temporary exhibitions of local artists.